— Do You Have A Dead Toenail? Do you have a dead toenail? What does this mean? Have you noticed that one of your toenails isn’t growing? Or isn’t growing like it should be? You might have a dead toenail! 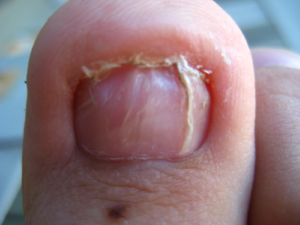 Those who are clumsy and drop things on their toes or stub their toes are most likely to get a dead toenail. Similarly, the 2nd toe is often bruised and affected in athletes as the shoe hits the end of the toe repetitively. This constant trauma to the toe can alter the nail growth and as a result the toenail can become thickened and deformed looking. Callouses and corns may also develop around the tip of the toe indicating severe stress to the site. Fungal infections of the toe is a main cause of dead toenails. When the fungus invades the nail plate, it changes both its structure and the colour. Some of the signs and symptoms of a fungal nail infection can include yellow/brown/white discolouration to the nail plate, thickening of the nail, crumbly/friable texture and can be malodorous. When left untreated, it can create permanent changes to the way your nails grow and sometimes hinder the growth of the nail. How can I prevent or seek treatment if I already have it?